And a host of tennis luminaries, including Roger Federer, Rafael Nadal and Novak Djokovic, paid lavish tributes to the redoubtable Scot. Yet, if the first-round match was the occasion where people were preparing obituaries for his glorious career, they were forced to wait longer than they had expected while the Scot was involved in a pulsating, but ultimately unsuccessful five-set thriller with No 22 seed, Spain’s Roberto Bautista Agut. Eventually, as the shadows lengthened over Melbourne, the twilight beckoned for Murray, whose infinite resolve and determination could not prevent him from losing the final set 6-2 after dragging himself back into contention. However, even though he had announced his retirement in advance of the Australian Open, nobody could possibly have imagined the Lazarus-style recovery which saw the 31-year-old orchestrate a remarkable counter-attack from two sets down against Roberto Bautista Agut. Murray congratulates Roberto Bautista Agut. 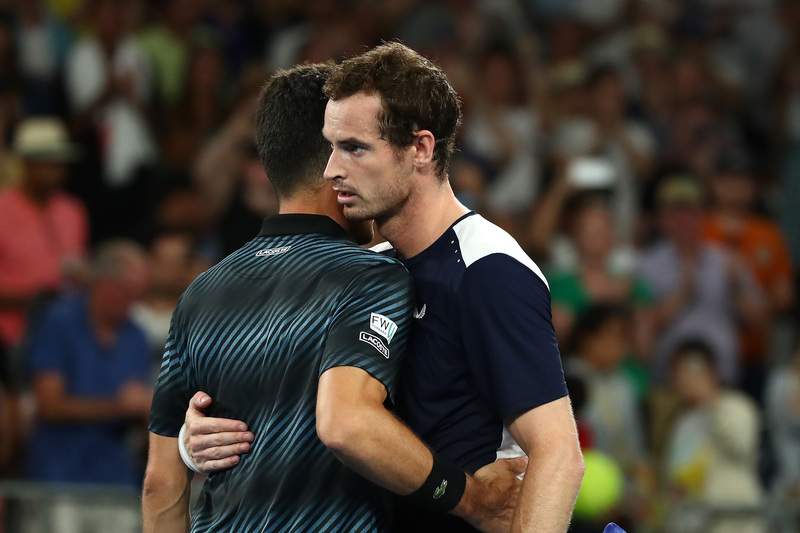 And Murray even hinted at the end that there might be another twist in his battle with injury when he talked about returning to Melbourne, despite all the farewell messages. In the build-up to the start of the season’s first Grand Slam, all we heard were the tracks of Murray’s tears as his frustration bubbled over at his litany of hip problems. Yet, with some of the pressure off his shoulders, he was able to swing free and loose as he battled back from the brink against the 22nd seed. It seemed there was nothing left in the tank when he was beaten 6-4, 6-4 in the opening two sets, but he has always been a redoubtable character, and his response in adversity was as terrific as we have come to expect. He produced all manner of coruscating ground strokes, drop shots and aces to launch his fightback and won two consecutive tie breaks 7-6, even as Bautista Agut looked shell shocked. Earlier, it had seemed like a procession. Then, suddenly, it was as if Murray had flicked a switch and we were back at Wimbledon in 2013. In the end, there wasn’t enough left in the tank and the Spaniard triumphed as his rival ran out of gas. Yet, even at the climax, with Murray facing match point, he sprinted round the court as if he was Usain Bolt, and eventually made Bautista Agut serve one more time. It was a reminder of one of his greatest gifts: the refusal to bow down in any circumstances, allied to his ability to retrieve the most desperate of situations. He knew the clock was ticking down before a ball had even been hit. But this was no meek surrender. On the contrary, Bautista Agut had to scrap for everything in this contest. At the end, Judy Murray stood up in the crowd and applauded his son and the spectators rose as one, while We Are The Champions reverberated through the arena.